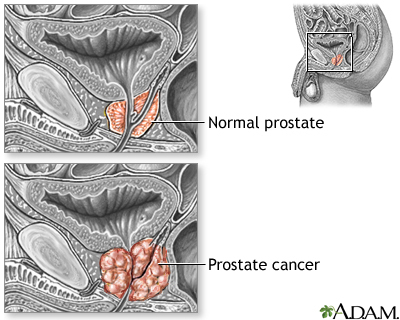 Prostate cancer is cancer that starts in the prostate gland. The prostate is a small, walnut-shaped structure that makes up part of a man's reproductive system. It wraps around the urethra, the tube that carries urine out of the body. A biopsy is needed to tell if you have prostate cancer. A biopsy is a procedure to remove a sample of tissue from the prostate. The sample is sent to a lab for examination. It will be done in your doctor's office. Scores 2 through 5: Low-grade prostate cancer. Scores 6 through 7: Intermediate- (or in the middle) grade cancer. Most prostate cancers fall into this group. Scores 8 through 10: High-grade cancer. Treatment depends on many things, including your Gleason score and your overall health. Your doctor will discuss your treatment options with you. Hormone therapy is mainly used for cancer that has spread beyond the prostate. It helps relieve symptoms and prevents further growth and spread of the cancer. But it does not cure the cancer. Surgery, radiation therapy, and hormone therapy can affect your sexual performance. Problems with urine control are possible after surgery and radiation therapy. Discuss your concerns with your health care provider. After treatment for prostate cancer, you will be closely watched to make sure the cancer does not spread. This involves routine checkups, including PSA blood tests (usually every 3 months to 1 year). You can ease the stress of illness by joining a prostate cancer support group. Sharing with others who have common experiences and problems can help you not feel alone. A cure is possible if the cancer has not spread. Hormone treatment can improve survival, even if a cure is not possible. Discuss the advantages and disadvantages of PSA screening with your health care provider. Talk with your provider about possible ways to lower your risk of prostate cancer. These may include lifestyle measures, such as diet and exercise. There are no medicines approved by the FDA for preventing prostate cancer. American Urological Association Education and Research, Inc. website. PSA testing for the pretreatment staging and posttreatment management of prostate cancer: 2013 Revision of 2009 Best Practice Statement. www.auanet.org/guidelines/prostate-specific-antigen-(2009-amended-2013). Accessed October 9, 2017. Moyer VA; US Preventive Services Task Force. Screening for prostate cancer: US Preventive Services Task Force recommendation statement. Ann Intern Med. 2012;157(2):120-134. PMID: 22801674 www.ncbi.nlm.nih.gov/pubmed/22801674. National Cancer Institute website. Prostate cencer treatment (PDQ) – health professional version. www.cancer.gov/cancertopics/pdq/treatment/prostate/HealthProfessional. Updated July 21, 2017. Accessed October 9, 2017. National Comprehensive Cancer Network website. NCCN clinical practice guidelines in oncology (NCCN guidelines): prostate cancer. Version 2.2017. www.nccn.org/professionals/physician_gls/pdf/prostate.pdf. Updated February 21, 2017. Accessed October 9, 2017. Nelson WG, Carter HB, DeWeese TL, Antonarakis ES, Eisenberger MA. Prostate cancer. In: Niederhuber JE, Armitage JO, Dorshow JH, Kastan MB, Tepper JE, eds. Abeloff's Clinical Oncology. 5th ed. Philadelphia, PA: Elsevier Saunders; 2014:chap 84. Stephenson AJ, Klein EA. Epidemiology, etiology, and prevention of prostate cancer. In: Wein AJ, Kavoussi LR, Partin AW, Peters CA, eds. Campbell-Walsh Urology. 11th ed. Philadelphia, PA: Elsevier; 2016:chap 107.